This was a terrific win for Australia on Mahatma Gandhi’s birthday — a national holiday in India. After the rained out 1st ODI, and after watching endless celebrations of India’s T20 win, this was a wonderful performance by the Aussies — make no mistake about that. Australia started badly but slowly constructed their innings and wrenched the match away from India. Along the way a few questions were asked of the India team. The three key issues for me were; (a) lack of intensity, agility, direction and purpose shown by the Indian team in batting, fielding and bowling, (b) bowling in the middle overs where Yuvraj Singh bowled probably as well as the other two Indian spinners in the team, (c) inability of the Indians to make best use of the conditions — and indeed, in the words of Rameez Raja, Australia looked like they were the ‘home team’. The Mach Referee will have a busy day? I don’t think so. Sreesanth ought to be fined, in my view, for appealing for a runout off a dead ball — a situation that was smartly diffused by M. S. Dhoni. It is likely that Sreesanth and Harbhajan may be fined for bad behaviour. However, If he fines Sreesanth for bad behaviour, he will need to fine Michael Clarke, Brad Hogg, Adam Gilchrist, Andrew Symonds and Mathew Hayden for bad behaviour too; something that Chris Broad hasn’t been too keen to do. So, I believe Broad may just collect his pay cheque and move on to the next destination! Dhoni’s captaincy was generally good. He was always trying something different. For example, in bringing back Pathan for 32nd over when things weren’t going well for India. He was always in control even when things weren’t really going India’s way. He didn’t appear unnecessarily flustered or charged. He is also a ‘keeper that does not believe in needless chirping behind the wickets. In a generation where almost every ‘keeper in world cricket — Matt Prior, Adam Gilchrist, Kumar Sangakkara, Kamran Akmal, Mark Boucher — keep up a continuous barrage of crap from behind the stumps, Dhoni sticks out like a sore thumb. And his stumping to get rid of Clarke off a legside wide was straight from the top-drawer. Did Michael Clarke bring the game into disrepute? Talking of that dismissal of Michael Clarke, I am stunned at the number of teams that are requesting replays these days! Michale Clarke was given out stumped by the leg-umpire Suresh Shastri. He walked away but then waited at the boundary rope — waiting for a decision-reversal! Clarke was asked to stay on inside the ground by his team mates! Shastri, under pressure, asked for a TV review after he had already given the batsman out! This isn’t a good trend. And by asking for a replay — either directly or implicitly — Is this a punishable offence? After all, if a fielder asks the umpire for a TV referral on a run out the fielder would be yanked in front of the match referee and fined. This was a clear breach/questioning of the umpires’ decision. Irfan Pathan bowled brilliantly I thought. His ball to get Hayden out was a beauty. My view is that he is back to his best. The pace was there as well as the accuracy. More importantly, he was probably the best of the three pace bowlers on view in terms of adjusting his length and pace to the pitch. There is, one senses, definitely a plan to use Yuvraj a bit in the middle and death-overs. Not a bad Jayasuriya-like ploy. Long overdue too. But my main problem in the last two ODIs is around the selection of Ramesh Powar in the team. He is a good bowler, no doubt. But if he is chosen for bowling just 5-6 overs a game, we are better off with a bowling allrounder like Joginder Sharma or even S. Badrinath in my view. Why? Even Rohit Sharma will give us 4-5 overs of off-spin and you get a terrific batsman for free! In yesterdays’ match Ramesh Powar batted below Harbhajan Singh in the batting order! For two games running, Powar hasn’t completed his bowling complement of 10 overs. It may be that Ramesh Powar is a better bowler than Harbhajan Singh. But his captain doesn’t seem to think so — judging by the fact that Harbhajan Singh completed his complement of 10 overs in yesterdays’ game! The other major question that wasn’t answered by the Indians was around the respective spinners of the two teams. While Harbhajan Singh and Ramesh Powar didn’t do too much with the ball, we saw Brad Hogg and Michael Clarke ask searching questions with their spin bowling. This doesn’t bode well for India in my view. After the initial assistance that the conditions offered the seam bowlers, the bowlers ought to have realised the slowness of the pitch. Instead of slowing down the ball, the Indians banged it short or fired it in. The Australians, on the other hand used the pitch very well and bowlers like Stuart Clark and James Hopes did well to bowl cross seam and split-finger stuff. Hopes and Clark bowled straight and without offering any width. Very clever stuff. One would have thought that the India bowlers would have used the slow Indian pitch conditions better! In the midst of a rather ordinary spell in which he exchanged words with both Hayden as well as Symonds, Sreesanth had what could best be described as terrible and most unsporting runout appeal off a dead ball. Dhoni’s approach to diffuse the situation suggested his awareness, sensitivity, smart thinking and cool leadership skills — he immediately calmed things down. Sreesanth should have a look at himself. Before the match he talked of getting a 5-fer on his home turf. He put pressure on himself. Now that’s fine if you can back it up with performances! The young lads’ aggression is not a problem. At least for me, that’s not a problem. We need more of his tribe in the team in my view! If Sreesanth can get under the skins of an opposition like Australia — and he has — and if he can continue to perform, then that would be fine! That is, if ‘trash talk’ is indeed where he derives his energy from and if he is able to divorce his body-language aggression from his bowling aggression then that would be fine — although I do not personally like it. But the real job that Sreesanth has to do is to bowl well. And he is not… He is wayward and a bit lost for ideas on ‘what to do next’. Sreesanth needs to learn from Zaheer Khan who has a vast repertoire but appears acutely aware of what is expected of him! Indeed Sreesanth needs to support Zaheer Khan and not trot off on a tangent that he has marked out on his own. This was typified by what would have been the last ball of the match. After having bowled 5 excellent balls, he sprayed the last ball wide for 4 wides. He could do well to sharpen his focus on his game. His aggression would be ok, in my book, if and only if he has a sharpness of match-focus to go with it. For Australia, Andrew Symonds batted very well, but the real champion in the batting — a somewhat underrated player in my view — was Brad Haddin. He played a sensational game to take the Aussies past the 300 mark. Although they were pegged back by the loss of two early wickets, Australia recovered really well to post a commanding and, as it turned out, a match-winning total. When India batted, it seemed like the old ills were back. The players just didn’t seem keen to take the singles and rotate the strike. 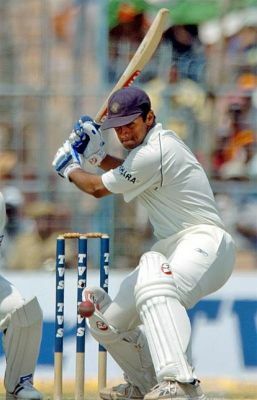 Sachin Tendulkar should have given much more of the strike to Robin Uthappa who was batting like a dream. Instead he tried to hit out like Uthappa was. Having said that, it took clever slower balls that induced false strokes from both Sachin Tendulkar as well as Yuvraj Singh. And both dismissals were brought about through excellent catches from Andrew Symonds and Matt Hayden respectively. This loss would have put a stop to the T20 celebrations and brought the team down with a thud. In that sense, it was a good thing for India provided lessons are learned. And to learn those lessons, the team only needs to look back to the events that happened 10 days back! Success in the T20 Championship came on the back of energetic fielding, electric running-between-wickets, sharp-and-focussed bowling, a never-say-die attitude, courageous batting and fear-free cricket. Unelss the team is able to rediscover those facets in their game — or acquire the personnel that will do it for them — this series is going to be a thrashing for the team. Here was a captain who, by throwing the ball to Joginder Sharma in the last over of two consecutive crunch-matches, had made an important statement about a young medium-pace-bowling allrounder itching to make it to the world stage. And here, through a freak training injury to a bowler, was an opportunity to strengthen both the bowlers’ confidence as well as the captains’ hand! And the selectors went for a batsman instead! But that’s the hand Dhoni has been dealt with. It will now be interesting to see if Dhoni plays all three former-captains in his team. I do not believe he should. I feel Ganguly should be sat down in this match. I’d go for Harbhajan Singh over Romesh Powar for this game merely because Harbhajan’s confidence and rhythm will probably be higher after the T20 matches he has played. The Twenty20 World Championship win by M. S. Dhoni’s Men in Blue has provided a much-needed breath of fresh air for Indian cricket. After the disappointment of the early and embarassing exit from the World Cup 2007 this was what Indian cricket needed. And it was secured by a fearless captain who does things his way. It was secured by a young team that played in the spirit of its captain. And this, I believe, is the blueprint for future success for India. The team has to dismantle the shackles — some self-imposed, some imposed by the ‘system’ that the team is part of and some imposed by history — and play with self-belief and mental stregth. And this investment in the future has to commence now. Two things need to happen immediately, in my view. First Piyush Chawla, who is injured, needs to be replaced. I would be very surprised if this replacememt is not Joginder Sharma. Second, as a significant policy-shift the selectors need to, from now on, name 17-member teams for ODIs and further stipulate that only a maximum 2 of the seniors can play in any game! First, this would prolong the careers of the Tendulkar-Ganguly-Dravid troika. Second, it would also provide a platform for youngsters to express themselves. From the India team that won the Twenty20 World Championship, Ajit Agarkar, Piyush Chawla and Yusuf Pathan would, therefore not be chosen. Ajit Agrakar needs to decide which side of the bed he wants to get up — if he does! Piyush Chawla is injured and Yusuf Pathan would be, in my view, unlucky to miss out. The first India-Australia ODI match is in Bangalore on Friday 29th September at 2.30pm IST (7pm Australia time). Probably the best team that could have been chosen? First up, I think it is a good thing that the selectors decided to delink the selection of captain and vice-captain for the shorter version of the game and the longer version of the game. It is good, in my opinion, that the choice of captain for the Tests will be delayed until after the ODI series against Australia. M. S. Dhoni and Yuvraj Singh were probably the best choices for captain and vice-captain respectively. The dropping of Ajit Agarkar and Munaf Patel is also a step in the right direction. The ODI game is not for sloppy cricketers who need to be hidden on the field. Ajit Agarkar needs to be hidden when he is bowling and batting while Munaf Patel needs to be hidden when he is fielding. Unless Ajit Agarkar and Munaf Patel improve, respectively, on their mental and physical approach to the game, they may well have played their last ODIs for India. Venkatesh Prasad, who was quite open and scathing in his criticism of Munaf Patel’s selection for the ODI tour of England has been heard. The coach, particularly a specialist coach — in this case, a bowling coach — should be consulted on matters of form and fitness. Munaf Patel was just not fit enough and played a very small role in the ODI series against England. After having let India down on her tours of South Africa (broke down midway through a Test after being selected), Bangladesh (had to return home after breaking down) and England (played a bit-role in one ODI), the player needed a kick up his backside and that is precisely what he got. Ajit Agarkar will remain an enigma lost to Indian cricket. He arrived with a lot of promise, delivered for a while and then, despite a string of no-shows and oh-oh-I-got-up-on-the-wrong-side-of-bed-again-appearances, has continued to hang around like a pimple that will just not go away! Gautam Gambhir continues to get a spot, perhaps as a result of his 50 against New Zealand in the T20 World Cup. He did play brilliantly in that game. But I continue to be amazed by this persistence in Gautam Gambhir. I am not quite convinced of Gambir’s place and his role in the team. Time will tell. I do not see the need for 3 spinners — Piyush Chawla, Harbhajan Singh and Ramesh Powar — in the team. That is a luxury in an ODI series, in my view. I am not sure why spinners cannot be rotated in much the same way as batsmen are. An extra bat or an investment in a potential future allrounder may have been a better option. I’d have gone with someone like Badrinath for one of the spinners. Sreesanth appears to have served his penance and is back in the fold. Irfan Pathan had two good outings in the T20 series and gets the nod. He appears to have lost a bit in pace and is only bowling at about 130kmph. But his accuracy and swing — his forte — appear to have re-appeared and that can only be good. His fielding also appears to have improved! Dilip Vengsarkar did talk about a rotation policy. Hopefully, this policy will allow them a look at players like Virender Sehwag, Suresh Raina, Manoj Tiwary, S. Badrinath, Mohammed Kaif, Rohit Sharma, Joginder Sharma, Ishant Sharma, et al. I wonder if Suresh Raina and Manoj Tiwary will also be rotated into the team for the subsequent games. They are both fully fit and are currently in the India A team picked to play South Africa A. It will also be interesting to see if anyone from the India A team (like Badrinath or Chopra) make the test squad for the Pakistan tour. After being stunned by the pyrotechnics in the match between West Indies and South Africa last night, I thought to myself whether India would be able to put on a similar show; a show that included power, intensity, commitment, strength, brutality, sharpness, alacrity and acumen in equal measure! I really doubt it! I won’t be surprised by a bad showing from India in this tournament. May as well be prepared for it! Apart from the fact that India is inexperienced at this form of the game, the team has as many as 4 players on the comeback-trail (Virender Sehwag, Irfan Pathan, Harbhajan Singh and Joginder Sharma). Moreover, the team has, in my view, at least 2 passengers who should not get even a single game (Ajit Agarkar and Gautam Gambhir). But more than these factors, I feel that India’s specialist Twenty20 players are warming the bench back at home. The above factors make me want to set my expectations realistically: an early exit and some much-needed R&R bfore the Australian ODI series! The fielding is, however, set to improve with the absence of the likes of Sourav Ganguly, Romesh Powar, Munaf Patel, et al. But notwithstanding with the persence of Robin Uthappa, Dinesh Karthik, Yuvraj Singh and Rohit Sharma, this team is going to provide several Sydney-Harbour-Bridge moments as players dive over balls that race under them to the boundary. The dry cleaner may get an easy collect as clothes may not be too soiled by sliding stops. But it may be a fun journey — albeit a short one! So may as well enjoy it while it lasts! This team would give the team upto 7 bowling options, with Sreesanth, R. P. Singh, Joginder Sharma, Irfan Pathan, Harbhajan Singh, Yuvraj Singh and Virender Sehwag. It will certainly be interesting to see how Irfan Pathan does. Even if India lose this series badly, the re-discovery of Irfan Pathan will have made the trip a worthwhile one! India needs this former poster-boy back in its midst.